Make sure you grab your tickets for the lethal lady of AMAA Jenel “The Flash” Stevens. Jenel will be fighting a TITLE Muay Thai bout for the WKA belt at the Friday Night Fights show. 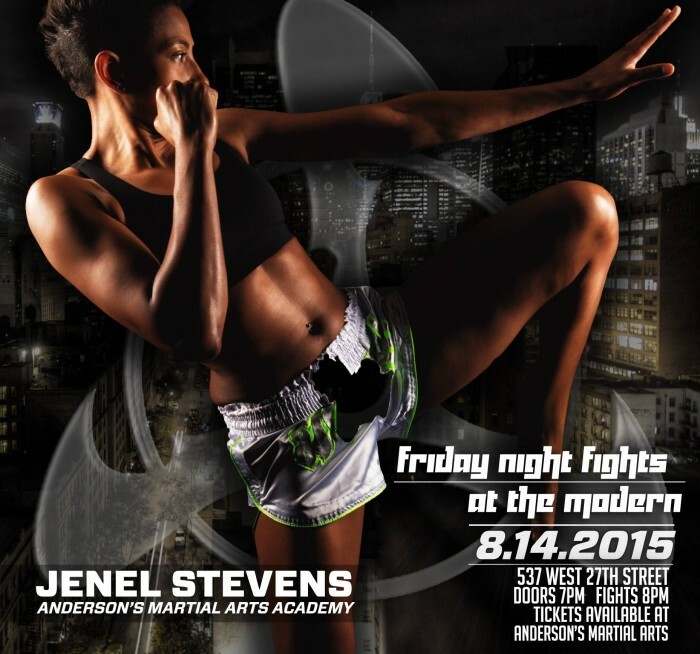 Jenel’s match is Friday August 14th at the Modern in NYC, where she will be fighting to represent Anderson’s Martial Arts NYC and the art of Muay Thai in a very exciting match with a tough opponent. As always we want to take this opportunity to acknowledge all of the students and training partners at AMAA that have supported, trained with and simply been a part of our amazing family. You might not realize it yet, but your support, your commitment and your enthusiasm for our arts helps Jenel, and every other student at AMAA push through and accomplish even greater goals then they first imagined possible. A community is only as strong as the people in it, and we must say that’s AMAA is full of unique, strong, positive, free thinking, creative, hard working, authentic, witty, intelligent and inspiring individuals. Did you know? Muay Thai happened to be one of the last arts Bruce and Dan were exploring before Bruce’s death. What makes Muay Thai such an effective art? and, why do all legit JKD schools have a Muay Thai curriculum? Muay Thai, known as the “science of eight limbs,” including punching, elbows, knees, kicks and at AMAA we add in the ninth, the head. The art also teaches some of the most effective clinching techniques. It is the national sport and martial art of Thailand, and an effective art for developing superior physical fitness and devastating self-defense. Known for its practicality, power, and speed, it specializes in powerful kicks and strikes with the knees, elbows and standing grappling. Besides proving itself as the toughest ring sport, Thai boxing is excellent addition to self-defense curriculum. I heard it’s the best workout there is- is that true? So you’ve heard huh? Even the fittest individuals don’t get out of this class with out a major heart pounding, muscle activating, challenging hour. The training itself is a great workout and develops physical and mental conditioning, along with a “never quit” attitude. Plus, the better and more proficient you get at the art, the more challenging your rounds, kicking, punching, bag work and focus mitt work will get. There is simply no physical plateau in Muay Thai class. In fact we are so confident you’ll love our Weapons Classes, we welcome you to use this email to get 1 full free week of Weapons and Street Fighting classes at AMAA! If I can only make 1-2 classes a week, is that enough? If you are busy you should try train Muay Thai/ and or Filipino Boxing at least 1x a week. We include striking from these arts in all of your JDK fundamental striking classes and mix them into your trapping and grappling. Ideally you would add in at least an hour a week of isolating your sticking in our Muay Thai and/ or Filipino Boxing classes. To get very good at the art of Muay Thai this means going past being effective in ground self defense) Sifu advises that you commit to a 2-4 hour a week schedule.